The Quidi Vidi Village Plantation officially opened its doors today. Supported in part by the City of St. John's and the Atlantic Canada Opportunities Agency, the Plantation will serve as both a focal point for visitors wishing to explore Quidi Vidi Village and a Craft Incubator for local artisans who will occupy its 10 purpose-built studio spaces. "The name Quidi Vidi Village Plantation comes from our earliest colonists who settled in the region and were known as planters and their fishing rooms called plantations," explains Mayor Dennis O'Keefe. "We are pleased to honour the history and heritage of the site with this name." The building itself is owned by the City of St. John's. In addition to the 10 studio spaces, the 4,600 square foot centre will also have office/archives for the Quidi Vidi Village Foundation, a visitor information desk, office space, and public washrooms. The redevelopment includes updates to the existing pedestrian area and the construction of a bridge to connect the Maple View Place site to the Sugarloaf Path of the East Coast Trail system. Improved vehicle and bus parking, as well as docking facilities, are another highlight of the Quidi Vidi Village Plantation. The Craft Incubator is intended to give new, creative energy to the Quidi Vidi area and will be operated by a working committee of the Anna Templeton Centre. The Craft Incubator is designed to provide emerging artisans with the skills, support and space to develop and launch their professional craft careers. In 2006, The City of St. John's adopted the Quidi Vidi Village Development Plan with the objective of ensuring the village is an attractive place for residents, as well as an inviting place for visitors. Through a partnership between the City of St. John's and ACOA, a cultural tourism enterprise was created in the form of the Craft Incubator in historic Quidi Vidi Village. The incubator programming was made possible through partnerships with the Anna Templeton Centre for Craft, Art & Design; RBC; and the Government of Newfoundland & Labrador's Department of Innovation, Business, Rural Development. As well, members of the Quidi Vidi Village Foundation, who have always been stewards of this special place, have embraced this initiative and played a role in the project. "It is through these partnerships we are able to announce that we have our first seven tenants now in their studios, including artisans who work with various mediums such as ceramics, glass working, textiles and woodcut printmaking," says Mayor O'Keefe. The Quidi Vidi Village Plantation will be open to the public during the summer months between 10 a.m. and 4 p.m. daily. 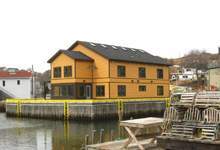 For more information on the Quidi Vidi Village Plantation please visit its website.